ETLG Inertial Aerosystems announce the recently enhanced performance of the compact, low-mass, single axis Model 2220 series MEMS accelerometer. Manufactured by Seattle based Silicon Designs’ the 2220 incorporates a new proprietary high-performance MEMS chip, along with high-drive, low-impedance buffering. The improved bias and scale factor over temperature performance are unmatched among other industry MEMS VC accelerometer manufacturers yet are still offered at a highly competitive price. The Model 2220 series is available in seven unique models, with standard measurement ranges from ±2 g to ±200 g, each with a wide frequency response measuring down to DC. Each accelerometer module is housed within an epoxy-sealed rugged anodized aluminium housing, with standard mounting via two M3 screws. Its lower mass (10 gm) and compact size (25.4 x 25.4x 8.4 mm), compatible with other designs in the accelerometer range, can help to minimize mass loading effects. This makes it ideal for zero-to-medium frequency acceleration and vibration measurements within a variety of industrial and commercial applications. 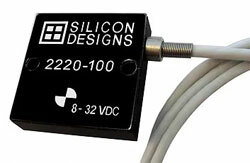 The Silicon Designs Model 2220 series can respond to both DC and AC acceleration, either with two analogue ±4V (differential); or 0.5 to 4.5V (single-ended) outputs that vary with acceleration. At zero acceleration, differential voltage output is nominally 0 VDC (DC response), with typical 1% cross-axis sensitivity. Onboard voltage regulation minimizes supply variation effects. Units are designed to withstand shock inputs of up to 2000 g over a standard temperature range of –55°C to +125°C. Each module is serialized for traceability and calibrated prior to factory shipment. A rugged, screw-on connector allows cable lengths to be easily modified ( approx 1 metre standard). The combined low mass, small dimensional size, and low-impedance outputs of the Model 2220 make the series particularly ideal for flight test, aircraft flutter testing, vibration monitoring and analysis, robotics, biomechanics, automotive RLDA, machinery and equipment control, modal analysis, crash testing, and general in-laboratory applications. Non-standard g ranges, packages and connector configurations are available upon request.